We never really grow out of our fascination with pirates, and St. Augustine is the best place in the country to imagine the time when plundering buccaneers roamed the high seas. 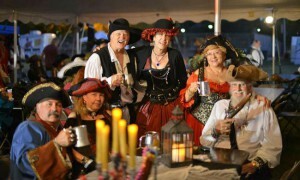 There’s no better time to live the pirate’s life than January 25-27 at the 3rd Annual Old City Pirate Fest! The weekend celebration is full of pirate-themed fun for the entire family in the Old City’s Colonial Quarter. Enjoy lots of food and drink options, live entertainment on two stages, games and prizes for the kids, vendors row with tons of pirate merchandise, and black powder and sword demonstrations. Entertainment includes live music, puppet shows and magic shows each day. Special performers include Dirty James and the Rusty Anchors, Tom Mason and the Blue Buccaneers, Keith Hill, the Forged in Fire Champions and Knife or Death Grand Champion. Be sure to look for The Ancient City Sirens, who will host a Gypsy Encampment throughout Saturday and Sunday. Getting There:The Colonial Quarter is located at 33 St. George Street. Ticket booths will be located at the main entrance to the Pirate Museum on Avenida Menéndez and the Bull & Crown Publick House at 53 St. George Street. Getting In: A Fest Pass, good for both Saturday and Sunday, is $7 for adults (15-65), $5 for seniors (65+) and $5 for kids (14 & under). Children 3 and under are free. Tickets for the Friday night concert featuring Tom Mason and the Blue Buccaneers are an additional $10. Friday, January 25: 7 p.m. to 11:45 p.m.
Saturday, January 26: 9 a.m. to 6:30 p.m.
Sunday, January 27: 11 a.m. to 4 p.m.
Mark your calendar for next weekend to open your imagination and live the pirate’s life! 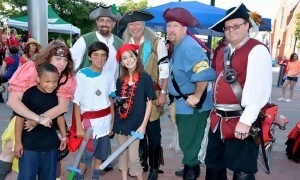 As always, the Old City Pirate Fest is hosted by the St. Augustine Swashbucklers. For more information, visit here.